Brandy Gomez Duplessis From BGD Makeup Artistry Studio Is "Keeping Up With The Kardashians"
Brandy Gomez-Duplessis of BGD Makeup Artistry Studio had the opportunity to provide her makeup and eyelash services (including her popular lip-sparklettes “Diamond & Pixie” from her cosmetic line “Queen B”) to the Kardashian girls and their mother. Los Angeles-Long Beach, CA May 22, 2008 - BGD Makeup Artistry’s Brandy Gomez-Duplessis is New Orleans’ own Makeup Artist to the stars. 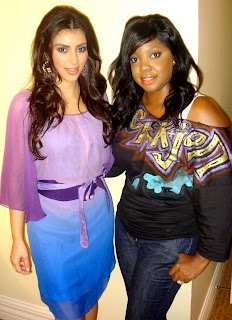 BGD has provided makeup services to several celebrities and just recently added the Kardashians to the list. BGD had the opportunity to use her own cosmetic line “Queen B” on the Kardashians family (Kris Jenner, Khloe, and Kim Kardashian). The Kardashians were in town on Monday May 19, 2008 to promote the Style Network reality show “Keeping Up with the Kardashians” Season 3 to more networks at The Cable Show ‘08 at the Morial Convention Center scheduled for May 18-20 2008 in The Big Easy. Makeup Artist Brandy Gomez-Duplessis said “Overall, I was honored to have worked with them. They were great girls, very soft spoken and very approachable and easy to work with. They made me feel comfortable and loved that I used the word baby when I spoke to them. They kept hugging me and Kris gave me a high five when I did her makeup and nailed it the first time. I really feel like an A-list makeup artist and when I said that to Kris she said “you know it”. It was a blessing to work with the most popular family on TV right now and be the makeup artist for Kim Kardashian, who is one of the most sexiest and popular person in the entertainment industry. I do feel like my career is moving forward and will continue to do so. I gave Kris about 8 lip gloss from my Queen B makeup line.To have been able to use my products on them, I feel honored. For Kris Jenner to ask me for my card so she can come by my makeup studio to support my business and Kim Kardashian to ask me for my personal contact info so she can call me when she’s in town to do her makeup validates everything that my local clients have been telling me …and that is ,your talented with those brushes or you’re on a rise to becoming a Celebrity Makeup Artist. I am just glad that finally the beauty and fashion industry has stop looking at me as just a New Orleans Makeup Artist and now just a talented Makeup Artist.